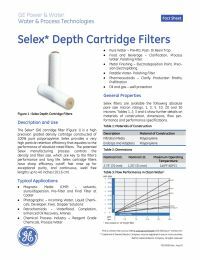 The Selex Cartridge filter high-precision, graded density cartridge filter is on the leading edge of depth filter technology. The Selex delivers consistently high particulate retention rates that equal the performance of absolute rated filters. The patented Selex manufacturing process controls the density and fiber size which are key to the filter’s high particle retention, high dirt holding capacity and long life. Selex cartridge filters are made from thermally-welded blown microfibers of polypropylene. No additives, resin binders, lubricants, anti-static or release agents are used in the manufacturing of Selex cartridge filters. Osmonics certifies that the filter material meets the requirements of the FDA. Manufactured for resistance to a wide range of chemical solutions.